Saturday Night Live is the undisputed heavyweight champion of political comedy, and, everyone agrees, it just keeps getting better. The show's gut-busting marriage of current event reenactments and funny faces continues to warm the hearts of liberal viewers yearning for a lighthearted reprieve from the travails of Drumpf #Resistance. Elizabeth Warren is chugging a beer on Instagram Live. "Is this thing on?" she asks, demonstrably wasted. Warren says hello to viewers and gets another beer, and jokes how it's her favorite brand because it has 1/1000th the calories as the average light beer. That reminds her she needs to take another DNA test, so she finishes chugging the second beer and then grabs a Q-Tip from the counter and swabs her mouth. She hands it to her husband Bruce off camera and tells him to mail it off to 23andMe. Warren gets a Facetime call from Beto O'Rourke who is getting a physical. He has a black eye from a "skateboarding accident." Beto turns his head and coughs a few times while making witty banter with Warren. They agree that it's so wonderful to live in a world "without walls or borders" that allows average Americans to see right into the everyday lives of their political leaders. Beto continues to talk into the camera as he bends over a table. He has one more thing to add before signing off: "Live from New York it's Saturday night!" His voice lurches suddenly into a high-pitched scream as the doctor in the background begins the examination. 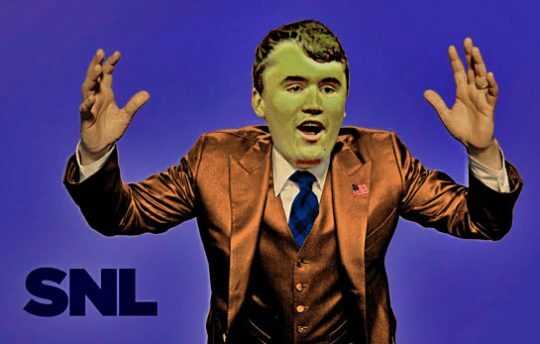 Charlie Kirk makes jokes about Democrats and political correctness. He is constantly interrupted by hysterical crying infants in the audience (portrayed by cast members). Each time they eventually stop crying after being given something that soothes them, e.g., a giant red lollipop with hammer and sickle design, a Colin Kaepernick jersey, a muscular Bob Mueller baby doll, etc. Charlie talks about how excited he is to be in New York City, "where anything is possible: Millions of people chasing the American Dream. And a fascist mayor who can't even make the trains run on time." The crowd loves it. Hillary Clinton, now in federal prison, is running for inmate council president of Cell Block D against Khalid Shaikh Mohammed. She delivers a robotic pitch about "restoring middle-class values" to Fort Leavenworth. She thanks the union of incarcerated journalists for their endorsement. She thanks her many former donors and associates serving time for fraud and other crimes. She thanks fellow inmate Bernie Sanders for his gracious concession. Cut to Sanders in a wheelchair, bruised and bandaged, muttering about millionaires and billionaires. KSM stands to deliver his pitch: "Uh, I don't know, death to infidels?" The inmates give him a raucous standing ovation. The journalists rush to interview KSM. Hillary loses again. 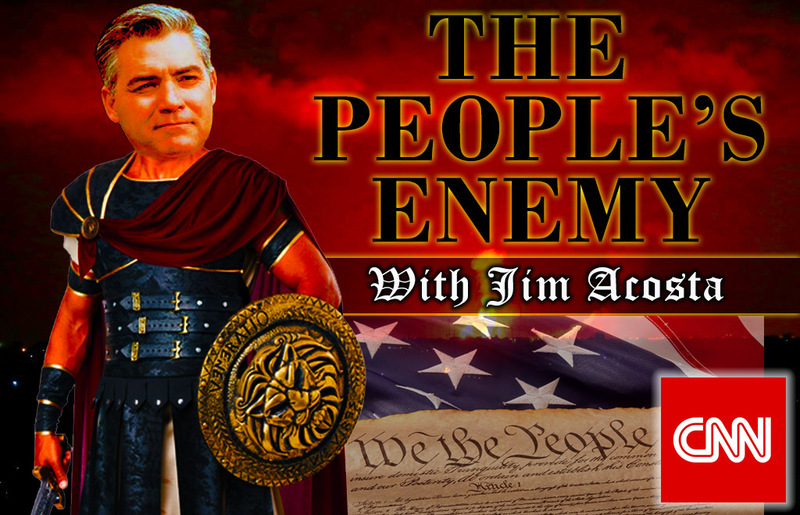 An advertisement for CNN's new show, "The People's Enemy" with Jim Acosta. A husky-voice narrator speaks over a montage of our hero journalist riding horseback through the night: "One man's quest for truth… shall not be abridged." Acosta approaches a lone building engulfed in flames. A sign above the door reads, "Democracy." A squad of shirtless, sword-wielding goons with words like "Lies" and "Corruption" tattooed on their chests emerges to block his entry. Our hero dispatches them with a single roundhouse blow from his giant pen-shaped bow staff. Acosta pulls out a pocket mirror to check his hair, then rushes inside. He emerges shortly thereafter carrying two babies wearing adorable onesies with the word "Facts" printed on them. The flaming building explodes and crumbles as he sprints away, and delivers the children to the waiting arms of their grateful parents. He tosses the bow staff aside, and is handed a microphone as attendants apply makeup. He looks straight to camera and says, "Good evening. I'm Jim Acosta, reporting for duty." 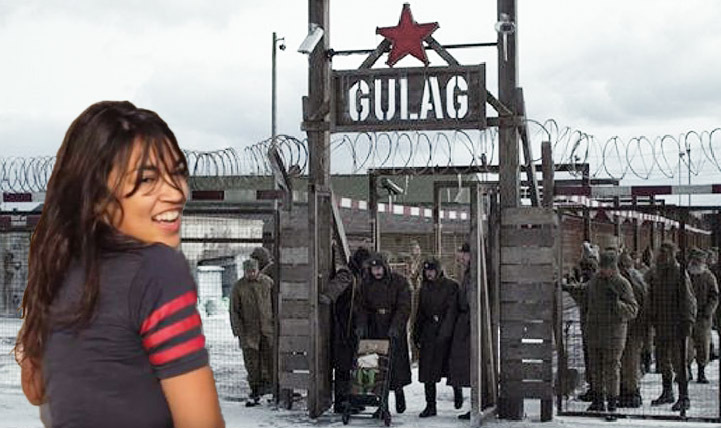 Alexandria Ocasio-Cortez dances to "Lisztomania" in various communist locales. 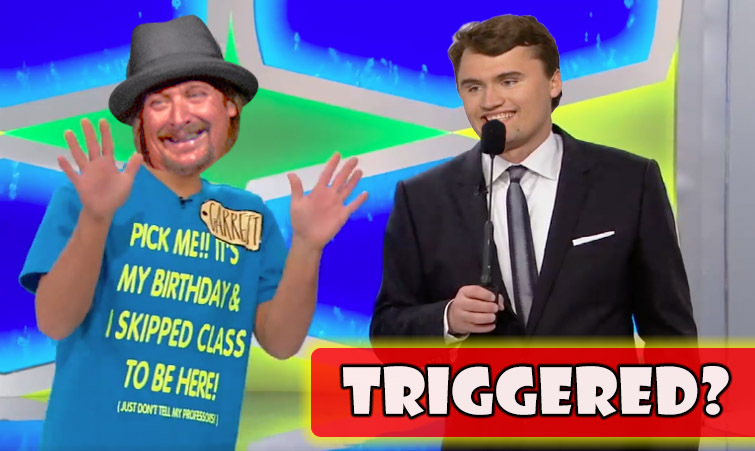 Charlie Kirk hosts "Triggered," a game show in which snowflake liberal college students compete for prizes by attempting to keep their nerve while being exposed to "problematic" material. An eager contestant named Garrett, portrayed by musical guest Kid Rock, has a chance to win a brand new Kia Soul if he can watch a 10-second photo montage without getting "triggered." When the first image appears — a painting depicting the Founding Fathers signing the Declaration of Independence — Garrett's head instantly explodes in gruesome fashion, showering Kirk in blood and brain matter. A "womp-womp" sound plays as the audience groans. And so on. Dr. Sebastian Gorka reads a passage from his critically acclaimed book, "Why We Fight: Defeating America's Enemies — With No Apologies," over R&B riffs played by G.E. Smith. This entry was posted in Politics and tagged Parody, Satire, Saturday Night Live. Bookmark the permalink.